Church Lawton is a small village (sometimes known as Lawton) located in the Borough of Congleton, Cheshire. Its location is such that its eastern boundary forms part of the county boundary between Cheshire and Staffordshire, and, because of its close proximity to Stoke-on-Trent, the parish has a Stoke-on-Trent postcode. The parish also contains the hamlet of Lawton Gate. According to the 2001 census, the population of the entire parish was 2,201. A township and parish in Northwich Hundred. Includes the hamlets of Hall Green (part), Lawton, Lawton Gate, Lawton Heath, Lawton Springs, Little Moss (part), Moss Pit and Red Bull. The population was 445 in 1801, 693 in 1851, 850 in 1901 and 971 in 1951. 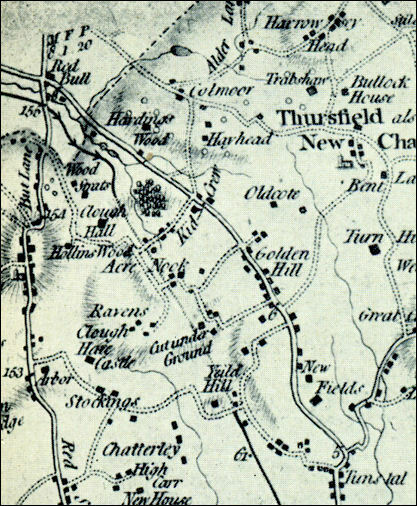 In the early 18th century the post road from London to Lichfield, Chester, Liverpool, and the North ran through Newcastle to Talke-on-the-Hill and then crossed the Cheshire border at Lawton. That part of the road between Tittensor and Talke had become so ruinous that in 1714 a Turnpike Act for its repair and maintenance was passed, and among the trustees were many Newcastle burgesses, including the mayor. In 1735 the turnpike trust was renewed for a further term of twenty-one years and the trustees included the mayor, justices, and recorder of Newcastle. When provision was made for further renewal in 1752, the town clerk was added to the list of trustees. In this way Newcastle was strongly represented on the managing body of the road. The Trent and Mersey canal is the black line running from the bottom centre of the map - where the canal goes through the Harecastle tunnel the map states "cut under Ground"